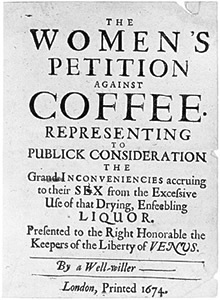 Just for fun… witness, the Women’s Petition Against Coffee. While I’ve frequently read of this petition in one coffee history book or another, I had only recently stumbled upon its full text (via Metafilter). Pity I can find neither the cover nor the full text of the Men’s Answer to the Women’s Petition… equally ribald by today’s neo-Puritan standards.